by Marc Lendler. Lawrence: University Press of Kansas, 2012. 184pp. Cloth $34.95. ISBN 9780700618750 Paperback $17.95 ISBN: 9780700618767. Marc Lendler opens his final chapter with the observation that “[r]eaction to the Gitlow decision was subdued” (p.124). So too was this reviewer’s reaction to Lendler’s book. Using existing sources as well as some original research, he has told us a good deal about Gitlow the man, much of which is quite interesting. With respect to Gitlow the case, however, Lendler presents little that is new or original, though he tells it succinctly and accurately in straightforward, accessible and occasionally lively prose. Unfortunately, it would seem that some of the most important questions that have been raised about Gitlow v. New York will probably never be answered. The Gitlow case had its origins in the assassination of President McKinley in Buffalo, New York. His killer, Leon Czolgosz, had attended a lecture by the famous American anarchist Emma Goldman. Authorities in New York, despite the trial and execution of Czolgosz, lamented the lack of any legal means to pursue Goldman, whose speeches and writings, they believed, caused the crime. In 1902 the New York legislature passed a criminal anarchy law that made it a felony to advocate “the doctrine that organized government should be overthrown by force or violence . . . or by any illegal means” (p.1). The law remained unused until 1919 when New York, in pursuit of its own version of the notorious Palmer raids, arrested Benjamin Gitlow, one of the founders of the American Communist Party, and several of his associates. Lendler includes a good deal of material on the actual trial before turning to the main focus of the second half of the book: “follow[ing] the case up the judicial ladder after Gitlow’s conviction” (p.2). Gitlow agreed to let the newly-founded American Civil Liberties Union appeal his case, even though the appeal meant postponement of the pardon that otherwise would likely have been (and eventually was) granted him. The ACLU argued that a law that prohibits a specific doctrine is unconstitutional, an argument rejected by the New York courts. The case reached the U.S. Supreme Court in April 1923, with the ACLU aware, “by a simple nose count,” that the chances for victory were extremely slim – “[i]n all the speech cases that had come before the Court since the beginning of World War I, only one justice other than . . . Holmes and . 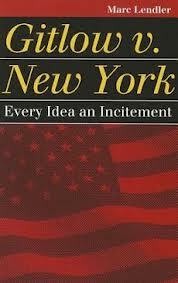 . . Brandeis had ever voted to overturn a conviction, and that was a single time on narrow grounds” (p.90). It was a Court already divided over the scope of the Fourteenth Amendment, most notably with regards to “freedom of contract,” but increasingly also divided over the First Amendment, with Holmes at first reluctant to utilize the Fourteenth Amendment’s Due Process Clause to apply free speech principles to the state because of the incompatibility of that approach with his opposition to “freedom of contract.” But Lendler shows how Holmes’s thinking evolved. And after Gitlow, the Court’s views on speech rights began a steady movement in the direction pioneered by Holmes and Brandeis (so much so that by the 1930s their dissents were being treated as if they stated the opinion of the Court). But the Court never formally overruled Gitlow. Thus, with the Communist cases of the early Cold War – cases that “shared so many features with Gitlow” (p.3) – the Court found itself walking a fine line between not undermining Holmes while still upholding the convictions of Communist leaders in the most notable of these cases, Dennis v. United States (1951). Nearly two decades later when the Court repudiated the Bad Tendency Test in Brandenburg v. Ohio (1969) it explicitly overruled Whitney v. California (a 1927 case also relying on the bad tendency principle) but said nothing about Gitlow. There are intriguing questions about Gitlow v. New York that may never be answered. For example: the case was argued on April 12, 1923, and reargued on November 23, 1923. The decision was not handed down until June 8, 1925. The record gives us no indication of why it took so long or why it was reargued. Or consider the fact that an opinion of 350 lines is most frequently cited for only 6 lines: “For present purposes, we may and do assume that freedom of speech and of the press-which are protected by the First Amendment from abridgment by Congress – are among the fundamental personal rights and ‘liberties’ protected by the due process clause of the Fourteenth Amendment from impairment by the states” (at 666). Lendler rightly characterizes this statement as the majority’s casual commitment to a “pathbreaking course….” (p.114) But why the majority did so has never been explained, and the author of the opinion, Justice Sanford, never commented on it. The mid-1920s legal community in general and civil libertarians in particular were upset by the Court’s reaffirmation of the bad tendency principle and the extension of wartime speech restrictions into peacetime; there was virtually no comment on the First Amendment [*574] incorporation, save perhaps for Charles Warren, writing in the Harvard Law Review. Warren deplored the thought that this new approach would lead to the national government interfering in matters that had been left to the states, reversing fifty years of contrary Court decisions without explanation or discussion. At the conclusion of his recounting of these developments, Lendler argues that “[e]very era revisits the bad tendency principle in light of whatever relationship between words and harmful acts seems especially threatening at the time” (p.3). In 1919, the problem of class conflict and Communist revolution. In the 1950s, the fear that domestic Communists were in effect agents of the Soviet Union and thus a threat to national security. More recently, debates over graphic descriptions of violence, speech denigrating ethnic groups or women, and speech supporting Islamic radicalism. Lendler concludes that “[i]n the future the subject will be different, but the debate will be the same: how should the law be applied to words that might lead to crimes?” (p.3) In short, Lendler tells us, we will continue to revisit Gitlowarguments and its standing as a precedent. One can only hope that future Justices, however much they understand (as did Holmes and Brandeis) that words can have consequences will also share the “deep aversion” Holmes and Brandeis came to feel toward “the only alternative: permitting government to be the arbiter of which ideas are considered useful and excluding the useless or harmful ones by coercion” (p.143). Lendler has produced a volume that more than meets the goals of the Landmark Law Cases and American Society series – to produce works that are “readable, inexpensive, and appealing for students and general readers” (p.157). Scholarly citations are consigned to a Bibliographical Essay at the end of the book. Lendler’s essay displays a solid command of the relevant literature; indeed, Lendler has also done some original research on the life of Benjamin Gitlow (mainly interviews with Gitlow’s son and others who knew him) that contributes to the lively biographical portrait that emerges from the work. But at the end of the day the book’s primary audience will remain confined, one suspects, largely to students and general readers. Warren, Charles. 1926. “The New ‘Liberty’ Under the Fourteenth Amendment.” Harvard Law Review 39: 431. Brandenburg v. Ohio, 395 U.S. 44 (1969). Whitney v. California, 274 U.S. 357 (1927). Copyright 2012 by the Author, Philip A. Dynia.